Recently, I was invited to a pre-launch tasting event for Daiya Cheezecake. Something I may or may not have mentioned on the blog before is that I'm technically not supposed to have dairy. Clearly, if you've seen any of my food posts, you know I don't listen to my doctors (I do not encourage similar behavior). I won't get into the nitty gritty but basically, my body is sensitive to dairy, not lactose-intolerant, just sensitive. How do you tell a dairy lover to never have dairy again though? It's devastating! Back when I was told this, there weren't a whole lot of non-dairy dairy options. Instead of milk, there was almond milk, soy milk and coconut milk. Gross. Now, we have Lactaid. Holy hell is this a gift from the gods. There's also now brands like Daiya who commit themselves to creating dairy-free options for people, like me, who aren't supposed to have it that also taste good. Let's be honest. I love cheesecake. When I received an invitation for a private tasting of Daiya's new "cheezecakes" that are dairy and gluten free, I said yes but I was also very hesitant. I basically went in thinking I wasn't going to like anything. Daiya is the perfect example of why you should not judge a book by it's cover. I was ready to give these stuff the boot and it turns out, everything is incredibly delicious. I was able to try all four of their cheezecake flavors as well as several appetizers that they either sell or that were made with one of their products. Chocolate Cheezecake What Daiya Says: Attention, chocoholics: This one is for you. Boasting a signature blend of cocoa and carob powders, the luxurious chocolate flavor is unlike any other. It's decadent, rich, indulgent - and once you've tried it, you'll wonder how you ever celebrated an occasion without it. What I Say: The chocolate cheezecake tasted fabulous. It was incredibly rich and very smooth. I felt it was more of a thick mousse than cheesecake though. The texture was very light and airy, not dense like you'd expect for cheesecake. This one ranked in at #4 for me. Key Lime Cheezeacke What Daiya Says: Bold and festive, Key Lime Cheezecake is like a trip to the tropics - but so much sweeter, and without the jetlag. Tart and tangy meets smooth and creamy to create a uniquely delicious flavor that will (much like a beach getaway) have your guests reminiscing for days. What I Say: I am not a key lime person at all. I generally don't like the flavor. It's too tart for me most of the time. This flavor blew me away though. I honestly didn't think I'd like it but I loved it. The flavor was light instead of overpowering with the lime and the graham cracker-like crust was phenomenal. This one ranked in at #2 for me. New York Cheezecake What Daiya Says: This one's for the purist - or for the topping enthusiast. Let the smooth, silky texture and classic flavor of New York-style cheesecake act as a blank canvas for whatever fresh fruit, syrup or sprinkles tickle your fancy. Or, you know, just enjoy it as is. Either way, we bet you'll soon believe in love at first bite. What I Say: Of all the cheezecakes, this one was most like the real thing. If you had me compare real cheesecake with this cheezecake, I would not be able to tell the difference. It was dense and creamy, just like regular New York cheesecake. The lady serving this flavor encouraged me to try a piece on its own and then try one with some toppings. If you need to be told a second time to have two pieces of cheezecake, you've got to be crazy. I absolutely loved this flavor. It was my #1 pick of the four. Strawberry Cheezecake What Daiya Says: With its sweet, fruity flavor and eye-catching hue, pretty-in-pink strawberry is poised to steal the show. Bring it to your next dinner party and you'll have everyone asking which fancy, schmancy bakery you stopped at on your way home. What I Say: The strawberry station was my favorite presentation of all four cheezecakes. It was served alongside pink champagne, my favorite! It was so pretty and welcoming. The cheesecake itself was pretty dense in texture and consistency. The strawberry flavoring was pretty sweet. This kind of reminded me of a strawberry yogurt. It was quite tasty but not one of my favorites. It came in at #3 out of the four varietals. So those are the cheezecakes. I was overall impressed. In terms of favorites, New York and Key Lime were my top choices. Strawberry and Chocolate, although good for being non-dairy, were not my favorites. As I mentioned earlier, there were also a few appetizers. I managed to get a photo of three out of the four at the event. 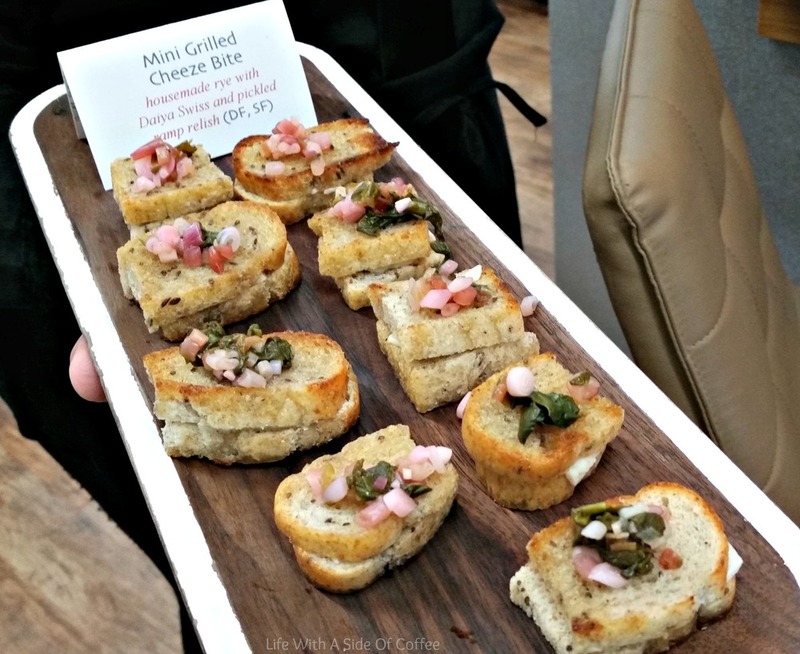 The Mini Grilled Cheeze Bite with housemade rye, Daiya Swiss and pickled ramp relish was amazing. This was my favorite appetizer at the event. I had about six of them. The Micro Quinoa Cheeze Burger with Daiya Pepperjack and caramelized onions was also fantastic. The Grilled Asparagus & Daiya Smoked Gouda Quesadilla was really tasty but the texture was a little weird for some reason. I wasn't sure if it was the cheeze or the asparagus but it threw me for a loop. They also served one of their pizzas which I loved. I'd definitely get that in the store. I am on a mission to cut the foods that my body reacts negatively to out of my life. I will never 100% get rid of dairy but I have eliminated 75% of it. I'm not buying non-dairy alternatives or lactose-free alternatives. I'm also watching my fructose intake since that seems to have a negative trigger as well. Just for general health, I'm looking towards more ancient grains for carbs but am fairly new to this world so if you have suggestions, please let me know. Other than that, have you tried Daiya products before? What do you think? Is this cheezecake something you'd consider?